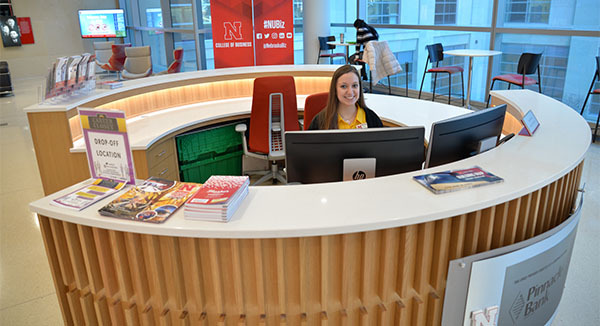 Emily Bergen works at the Welcome Center inside the west doors at Howard L. Hawks Hall. “The incorporation of the Welcome Center has been very exciting. I love that it features several of our showpieces which tell the stories of our donors and alumni who made the building possible. You can always tell when guests come here for the first time because they are speechless. I have heard many ‘wow’s’ when guests walk through the doors and even heard our building described as palatial,” said Bergen. Bergen, who previously worked as a recruiter at the college, enjoys greeting the many students, faculty and staff who come to the building daily. She also appreciates talking with alumni who have never seen the new building. She also assists with facilities operations’ needs, such as event support, and other building and receiving needs.